The page is not about the arts, although we very much like the arts. In this case, A.R.T. is a well-known Hungarian abbreviation for UFO. Azonosítatlan Repülő Tárgy (Unidentified Flying Object). This does not mean necessarily extraterrestrial spacecraft in the aviation technology, it just means something that flies and appears on the radar but there is no response to any radio communication warning. The radar responder does not respond either. Along the same logic, a metallised balloon is also unidentified. From the movement and the characteristics of the echo of the “something” out there the radarmen can decide what it is that they have seen. For the better part of the cases these issues get comfortingly cleared up. The “skeptics” make a living out of not believing. They don’t want to accept anything that they have not learned from the Alma mater. They are more believing than the believers and as bigoted as the inquisitors earlier. Flying craft of unknown origin enter Earth’s atmosphere almost every minute and all ostrich tactics and defamation efforts are all in vain, people are still curious about the thing. I am an adept at making fake pictures and I can copy whatever onto anything. The skeptics are right that the images put on the Internet can be manipulated in any way. However, images captured on film is a completely different situation! All negative films are holographicTOO! Apart from the things which you can see in the picture all the negative images carry a hidden holographic plus dimension! This is not yet possible to tamper with. Yet, the skeptics have learned about it. If I create a hologram of the negative on my laser bench, then this third original dimension appears in the hologram, in which I can measure distance, almost the same as in the real world. This busts all counterfeiting. Any negative will do the thing, but with a negative projected form a computer or a montaged picture the situation is completely different. I can only measure the distance of the montage table there. Computerized tempering shows only 0 distance, because there is only axonometric depth instead of the real 3 D. Let’s see if the skeptics can fool me with their pictures, I look forward to it. which are very often can be observed in similar images. Those little balls - and they are not even that little, because their size ranges from 20-30 cm to a few meters in diameter, or even measuring a few dozen meters. Their movement is so fast is that their appearance, disappearing, shift, might not even be followed by the naked eye. There are a lot of film footages where you can see UFOs, and a dimension researcher can learn quite a lot from looking at them. How a UFO appears, where they disappear, or a probe of which 3 can be seen sharply above and five dimly in the image . Often they only flash up in one frame and I do not take them seriously because it can be just an emulsion error. But when two consecutive shots have an error in the same place that excludes (makes it improbable) this possibility. These probes can be seen in recordings which were made such a very long time ago that we can exclude the accusation of counterfeiting. This technique does not work with spatial shifts but some other way. If we can sneak-learn it and copy it then we will have learned a kind of technology which can be used not only in space travel. This could be a big step ahead in transportation or travel which cannot be surpassed by anything working mechanically. 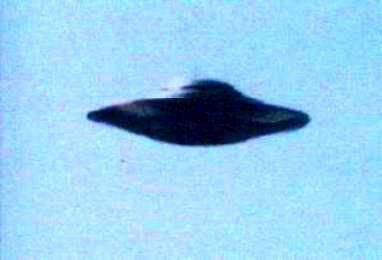 The UFOs do not fly at great speeds as they arein most cases do not even move. They can move also, because if they could not move, you won’t even be able levitate above the ground. Let us call this gadget space engine. This can also be used for locomotion, levitation or for speeding around and flying according to our conception. The spatial displacements measured on footages can reach up to 6 times the sonic speed or a speed of 6-7000 km/h in air, which is somewhat medium-dependent even for UFOs. It can reach the speed of several hundreds of km/h even under water as indicated by different observations recorded in ship diaries. No earthly craft (submarine) can move at such high speed under the water. Not even torpedoes. Such a small probe can be seen in this footage. Below the right side of the UFO. These probes change locations awfully fast, and often their appearance is similar to shining Christmas tree ornaments. Such a probe could not be damaged with anything. The shining guard is a space boundary (dimension bubble), which of course no ground weapon can penetrate, and beam weapons, laser weapons are also ineffective against it. In case of an attack they jump in front of the UFO. The craft itself can change its location within thousandths of seconds and it can leap out of the solar system merely with one single jump. It leaves our space essence during the jump so the attacks directed there we come up with are entirely ineffective. Nice big hats or lampshades. But how big?! alien craft are often, but not always circular symmetrical. This form is convenient because you can go in any direction in space, and so it does not have a front and rear end, as in our fighter jets. This thoroughly makes it difficult to attack it in the back. 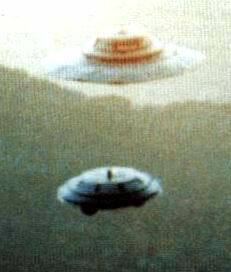 Two types of UFOs can be seen here. I have images of a wide range of UFO types and I have done a holographic check on many of those. The thing exists, and we need to take this seriously, because the mouth flapping will not be the solution. Today, the dialogue of the deaf is going on about it. The space jump does not involve any movement in the traditional sense of the word. Alongside the space engine there is such a little gadget in every spacecraft in which there is a space source just like in the middle of the Sun and through the manipulation of this we can disappear from that part of the space which is known to us. Much information is available about this in our previous pages. The spatial dimensions are layered such as strudel roll cake. These cakes are therefore involved in celebrations worshiping God. Dough-filling-dough-filling. Spirally. The sweet fillings represent the “sweet” Air characteristics nested in the space essences represented by the element Fire and the dough signifies the separator. Roll cake traditionally used to be baked in a horseshoe-shape by the housewives which, in addition to the internal structure was the symbol of luck. But why? In any case, the the syllable “KO” means source for the Eastern peoples. Pha is father in Tibetan and means also “on the other side”. It is common for an UFO to stand in air in a weird way like this. Where is the down direction for them then? Anywhere. It depends on the position of their own spacesource and on where their internal “down” direction is. That is where “down” is for the ones sitting in the craft. This craft can flip on any of its side. It is true to all UFOs since without its own space source it would never have made it to planet Earth since everything is as distant in space as we know it. And it is the same for them too. Although this UFO is completely horizontal, but two such accompanying probes can be seen in this picture as I have talked of previously. The left-side one moves fast in the space, so it looks slightly blurry but the one with a spherical shape can be seen quite clearly. Perhaps, this one wasn’t moving during the expedition time. This is a rather blurry picture, but the accompanying probes can also be seen in it. Earth is a dangerous planet. Not because its weapons are so good but because of the complete unpredictability of people. They are not shooting at them because they feel threatened but because they are afraid and because they’ve got something to shoot with. if all you have is a hammer, everything looks like a nail - said Murphy. The adult world behaves like children. The civilization, which made it here from the distant stars certainly have the weapons with which they could wipe out whole countries, or even the entire planet. Why have this not been done so far? Because they do not exist? No. Because they are cowards? No. Because they are smarter? Have they been through the hodgepodge era, the atomic and other types of wars and also space battles? Probably. Now it’s just a question of malicious or “touchy” the “invaders”. We will learn a lesson then.